It’s almost spring time here in the Bluegrass state, and I am just aching for it! I adore spring…to me it means new life, blooming flowers, greener grass, and open windows. Spring inspires me to bring out my white dishes and set our table with flowers and greenery, along with whatever springy garden finds I can find around our home. When setting our table for each holiday or season, I like to try and shop my home…I mean who has a gazillion dollars to go out and buy new things? You don’t have to spend a ton of money to get a fresh springy tablescape. I started with these aqua ruffled placemats as my base. I wanted a little color, but not too much. I added my inexpensive white stonewear from Walmart. Shhh…don’t tell! 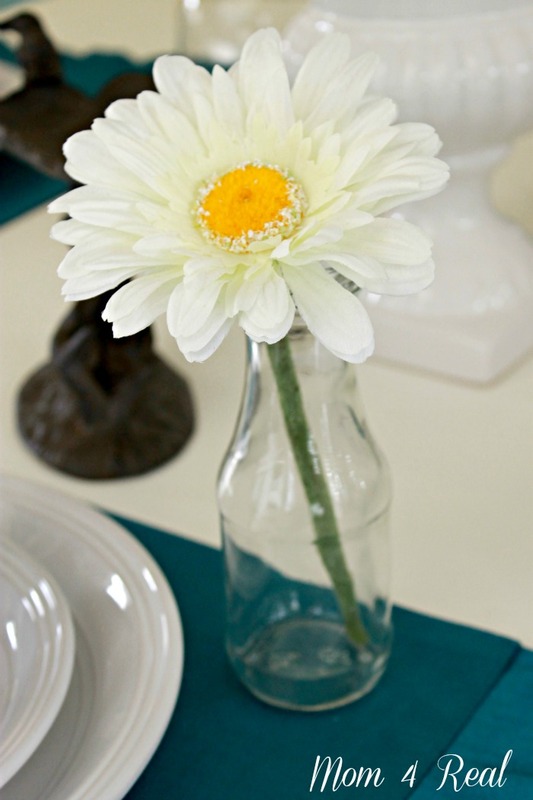 I added some faux daisies in glass bottles for a sweet springy touch. And grabbed some cute garden knick knacks from around my home. 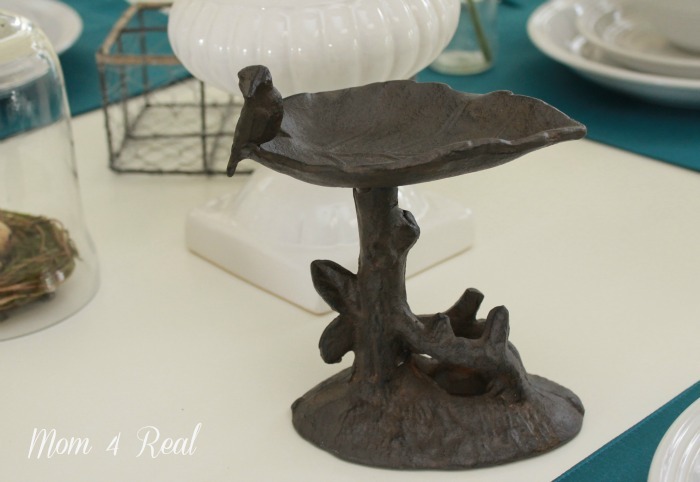 My favorite is the this little iron birdbath from World Market. I simply placed an ivy topiary in the center and just sat the other things randomly around the table…I think it feels fresh and clean. All of the details make me feel like I’m outside enjoying my garden, even if it’s not quite warm enough yet. Need a super easy quick fix to spring up your table? You can always just go with a vase full of tulips in the middle of your table. Come see how I used Fresh Flowers and Plants to Spring Up My Home! Be sure to check out all of the other spring tablescapes being shared this week! A huge thanks to Bonnie and Trish at Uncommon Designs for such a fun series! Do you decorate your table for different seasons? I really like the topiary in the middle of the table, the height is perfect! I love it! Very clean and springlike! 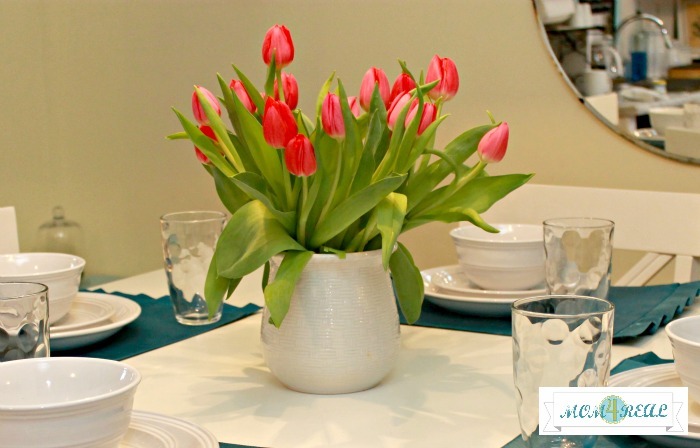 I love the daisy by each place setting… and the tulips! I’m a HUGE flower lower myself! Yesterday I shared the orchids I grow at my home on my blog. If you have time maybe you could hop over and take a look! I found you through Flamingo Toes Link up. I’m your newest follower! You totally put in a cheery mood with that bright pretty table setting and made me even more ready for spring! thanks its lovely. What a gorgeous table! 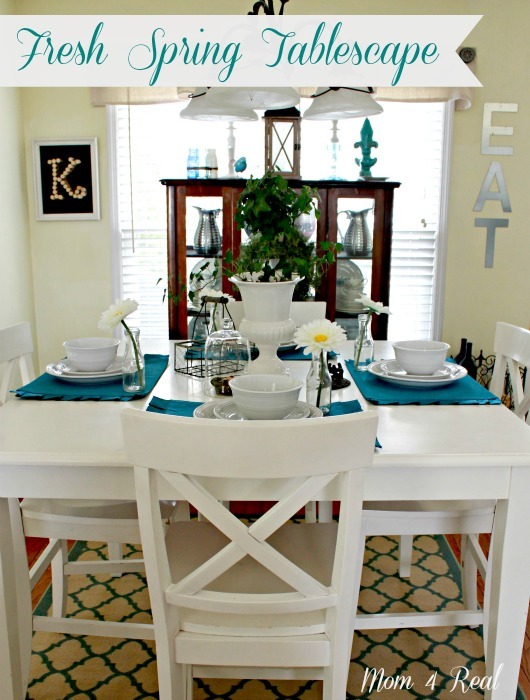 I love the turquoise placemats and I can’t believe your white dishes came from Walmart. Love how you used stuff you already had to save money. 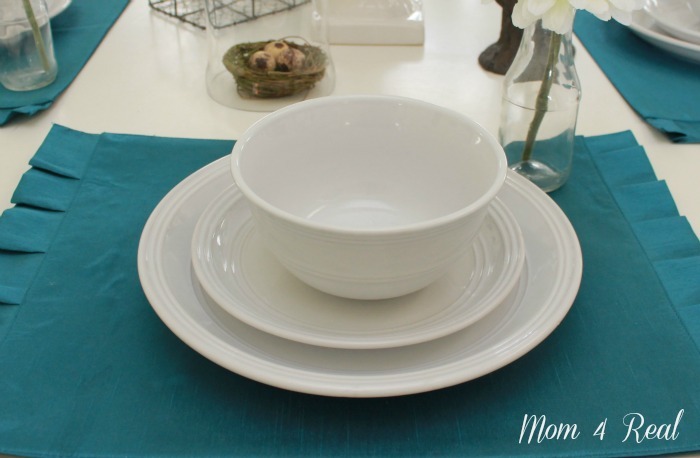 I love the fresh white dishes against the aqua placemats! Very pretty! So clean and fresh. 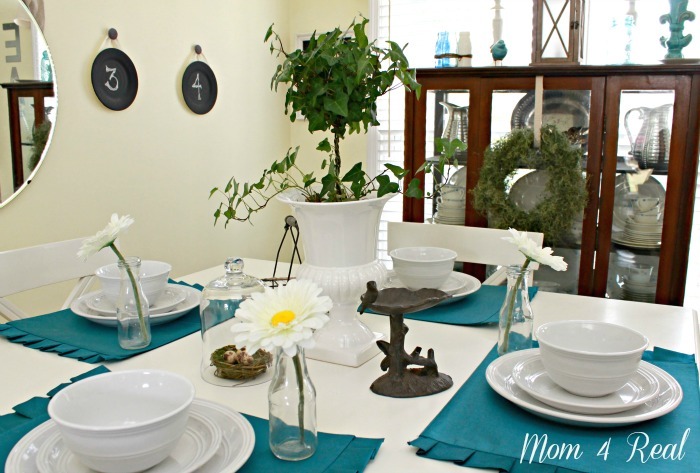 Love the aqua placemats and the daisies. Thanks for sharing, visiting from BNOP. So pretty! Love the white and blue. I found you today at the Think Pink Linky. I hope you can stop by my blog and leave a comment, too! Your table does look so fresh and pretty. Love the garden items you used in the center. i love the punch and fun with the pops of turquoise!